This article is about the The LEGO Movie character. For the Scooby-Doo character, see Velma Dinkley. 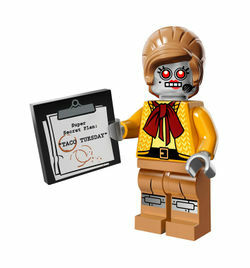 Velma Staplebot is one of the characters in the 2014 film, The LEGO Movie. She is the personal assistant / secretary to President Business. She is one of the few who know about his secret identity, Lord Business. Velma Staplebot wears medium nougat trousers and boots, with a bit of her silver plating in between. Her vest is flame yellowish orange and patterned with cool yellow arrows. She wears a black belt with a flame yellowish orange coloured clip. She wears a cool yellow vest and a dark red ascot. Her head is silver with bright red eyes, visible white teeth, bright red lipstick, and a black microphone. Velma's hairpiece is a new mould which depicts a medium nougat beehive hairdo.